Create a calm haven with the AromaWorks Electric Diffuser. Featuring a subtle colour changing LED light for an aesthetically pleasing and peaceful display, the electric diffuser allows you to select an aromatic oil to suit your mood. It effectively dissipates your chosen scent, filling the room with a sensual fragrance that can soothe or uplift. 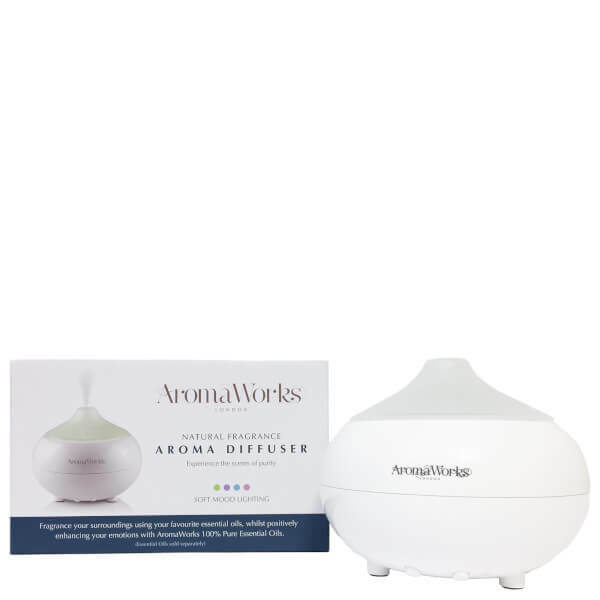 Suitable for use with the AromaWorks Essential Oils. USB Adaptor. Place the machine on an even surface. Fill the water tank with water, then plug in the adaptor. The LED light will flash and the power LED will show red. If you plug in the adaptor first then add water, please turn off the power and restart.